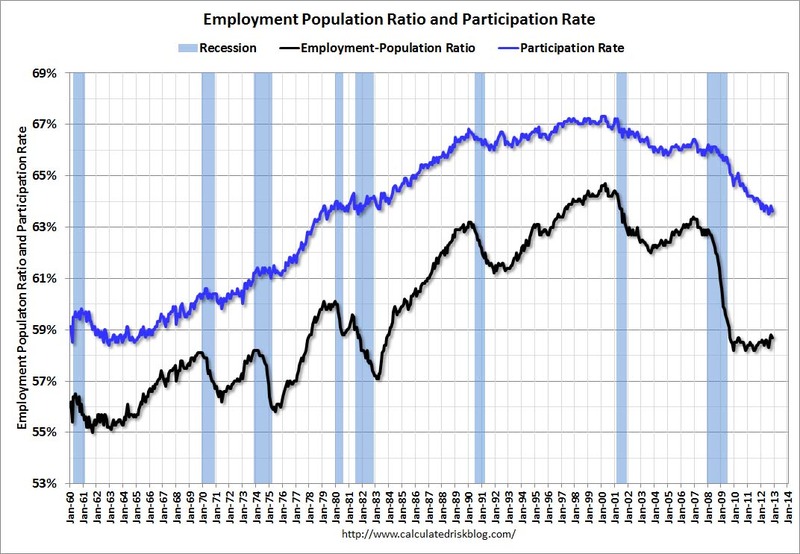 The blue line is the labor force participation rate, which includes everyone who is looking for or has a job in the US, as a percentage of the total population. One of the routine critiques we hear each month when the unemployment rate estimates are released is that they show a rosier picture than reality, because much of the decline in the unemployment rate has been due to workers becoming discouraged and dropping out of the labor force because the economy is so bad they don't expect to find a job. Yet, looking at the time-trends, this does not appear to be the case. 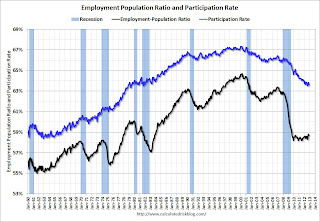 Rather, workers are dropping out at more or less the pace they were before the recession, due primarily to demographic factors--the population is aging, so larger and larger shares of the population are reaching retirement age. In other words, changes in the headline unemployment rate more or less accurately reflect the health of the economy.